Social Network connection diagrams have always received a passing glance from me. Back in the days when facebook was more lax about security, I used to enjoy the ‘advanced search’ function, for example, “School: Methody, Religion: Atheist” or “Location: Belfast, Gender: Male, Interested in: Men” would always provide an interesting evening of facebook creeping. This tool, providing mere pastime curiosity for me, was rightly scrapped after being used for brutal repression by others. Homophobic religious fundamentalists querying facebook for Saudi Arabian lesbians, such new technologies that had gone a small way to liberating these women, was turned and used to help their persecution. Though I can’t delve into the same level of detail now, there is still enough information available from facebook to provide an evening of amusement. Or as I call it, research, into the data set of people I’ve met. The first thing I noticed about this graph was that the majority of my friends, or certainly a large minority, were very disconnected. The large clusters, identifiable by the grey, include friends from secondary school (~350), friends from university (~100) and friends from Global Young Leaders Conference (~50) respectively. This adds up to around 500. Only just over half of my friends list. What about the other 400 or so friends, are they just totally disconnected from each other? Before I look at that, I’ve received some amusing comments on facebook about this one already. Lee Sharkey Philip bell is such a bridge between your cool friends and your oxford ones. Phil Bell’s prominence is an endorsement of MyFNetwork, with him being the sole link between my school and my college. These two groups are very closely knit within themselves but have next to no relations between each other. To guesstimate what sort of scientific words I might use here, they are closely intrarelated but distantly interrelated. Perhaps over my time at Oxford, some other school friends at other colleges will begin to become more prominent too, or my friends at Oxford who were involved in GYLC and MUN will become more prominent. To a certain extent the 400 disconnected friends, that is, people I’m friends with but who aren’t friends with my other friends, can be explained from people I have met at particular events, such as my week and a half holiday at oxford interviews or from many MUN conferences, or even just from one particular concert I played/sang in or something. There may be many small groups that MyFNetwork simply failed to detect, my primary school friends list contains about 30 people and they are nearly all mutual friends (indeed most of them, except for myself, went on to Belfast High School and Belfast Royal Academy, so they are more likely to be friends with each other than with me!) The Whiteabbey Primary School group doesn’t seem to show up here though. Other groups such as my Scandinavian and other European friends from the Rybak community don’t seem to have emerged, though I can spot their names among the dispersed entries around the edges. Nor was MyFNetwork looking for family links though that would count for only comparatively small number of friends. A few other online communities as well as groups such as the Belfast School of Music friends aren’t accounted for. Ultimately, it seems that an unusually large number of my friends do just seem to be unrelated to each other and I’m not really sure what to make of that. … sadly would not work with my number of friends, bad news for their developers, given that over 900 friends is soon becoming relatively normal in the facebook world. This would be the analytical tool I would recommend. 25 clusters was still not enough for me, but it certainly was an improvement on what other apps were offering. The Lime Green of oxford can be spotted easily, while this time my primary school is visible down on the bottom right, in Green. 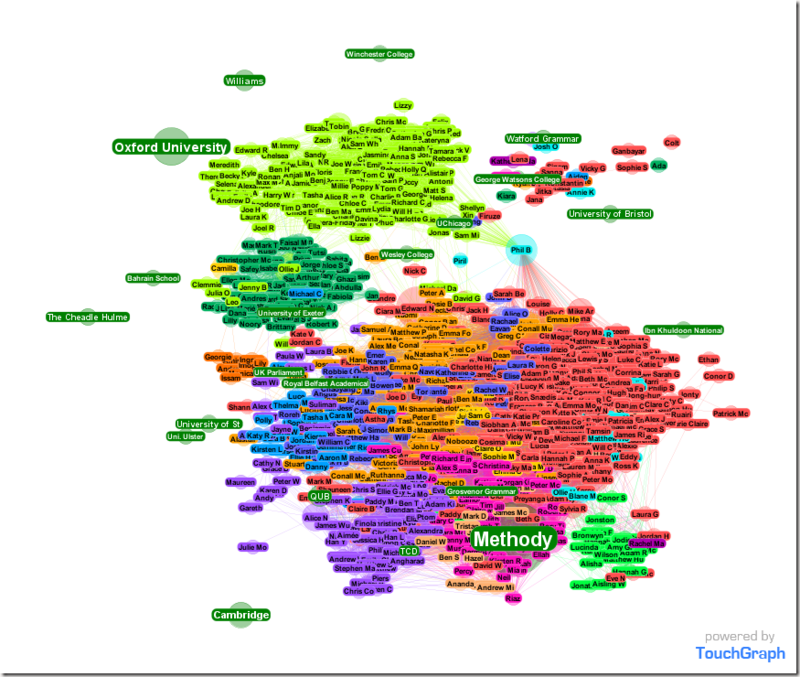 In the large ‘Methody’ cluster, we can actually see it is made up of a variety of different clusters (in fact, many non Methodians have been dragged in.) GYLC is visible in the dark green, whilst most of the left hand side is made up of the MUN and Rybak clusters. In the bottom left, quite a few of the purple are either family or family friends, I’m impressed that Touch Graph picked them out. There would seem to be much less noise in this graph. 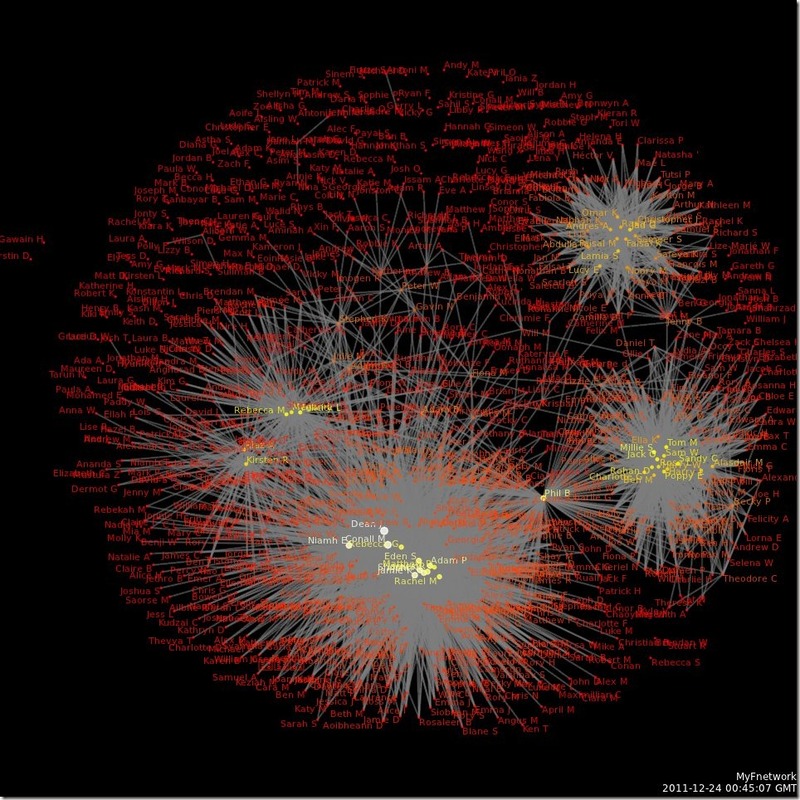 That is mostly because Touch Graph is designed to show clusters, those who have few or no mutual friends, simply aren’t present in the graph. I suspect more people are linked up that were in the past graph though, suggesting Touch Graph is much better at following at least a few steps of degrees of separation. Dare I say it but it also seems that within the Northern Ireland community, there are occasional hints of clustering by religion, or more to the point, denomination. I suppose this can be expected, but I’ll readily admit the possibility makes me uncomfortable. How much have I really learnt from these? I can’t go into details, without giving things away/offending people, but I have had all my facebook friends neatly categorised into over a dozen different friend lists for about 2 years now and I have been hiding/showing statuses and other posts to different friend lists on the basis of their content, relevancy and privacy for all this time. My facebook friend lists have always had organised what these apps manage only in a more crude form. I think the interest is in that by looking at links alone a computer can approximately spot the same friendship groups that I can, when I have the benefit of my personal relationship with the people and background knowledge of how they know each other (knowing about the links, not just that they exist.) If these sorts of tools could access similar knowledge to us, through statistics on our interactions and messages with social network friends, then how much more accurate and subtle could these automatic analyses be! Accurate and subtle information that will be stored in the cold chip of a server, not our minds. Having looked at how my friends seem to relate to each other, I think I will try again to delve back into their politics, religions, ethnicities and other background information. That shall be for another post on another day.